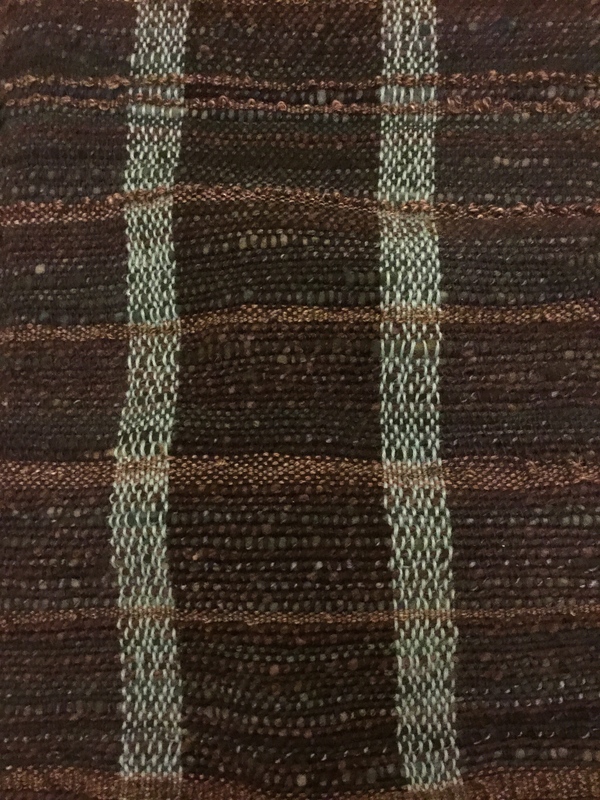 The stormy weather and holiday break gave me the chance to do some weaving. Finally. I’ve taken possession (temporarily) of my guild’s 30 cm Ashford knitter’s loom. I had all these crazy ideas about making wider fabric and then cutting and sewing it into a vest like this one from Purl Soho: Quilted Vest. Whether I take the plunge and cut my fabric and sew it into a garment will depend on how brave I’m feeling. For this project, I used commercial yarn for the warp and a variety of handspun from my stash in the weft. It’s either Ryeland or BFL and there is some silk in there too. There is also some yarn I spun from a luscious combination of camel/seacell/faux cashmere from HilltopCloud. Honestly there was no real plan for warping. 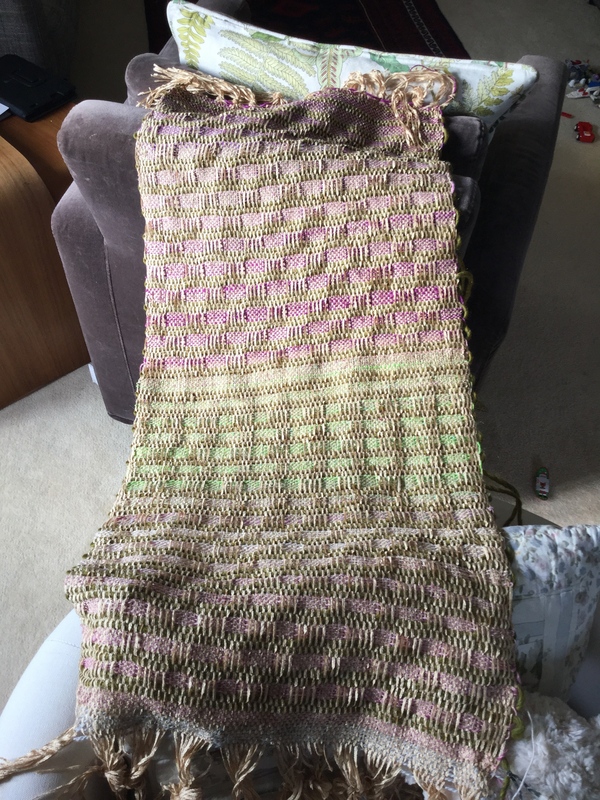 I decided how long I needed the warp to be and how wide and then made do with the yarn I had. 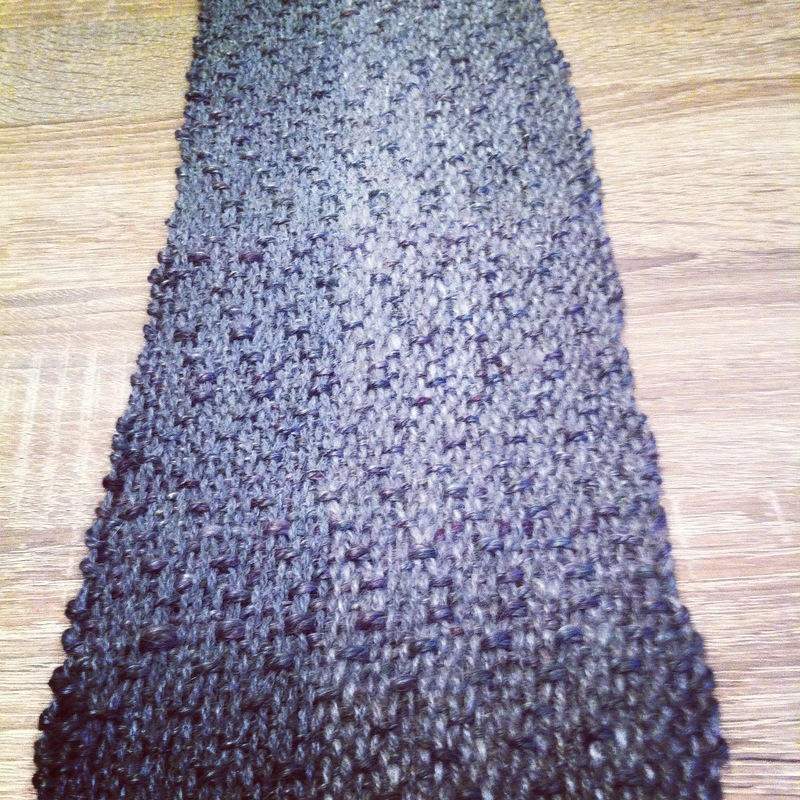 I used a navy silk/wool, alpaca (turquoise) and some black super wash–all picked for sturdiness. Similarly there was no plan for weaving–except I wanted to use as much of my yarn as possible! (There’s still a little left.) The only somewhat fancy technique I used was to make little loops by randomly picking up the weft with a long knitting needle, packing the weft with the reed and then pulling out the needle. If I’m brave this cloth could become a fancy vest. If I play it safe, it will be a cosy wrap. I wove my second project on my own 15″ Cricket loom. I used hand spun suri alpaca for the warp and some of the left over camel/silk for the weft. 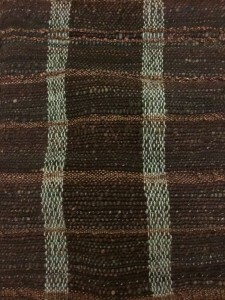 This technique is called faux twill, which is described by Jeen in the rigid heddle looms group on Ravelry. 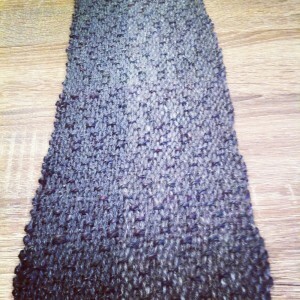 I’ve been wearing this project as a scarf. The third project was also woven on my Cricket loom. I used commercial yarns from my stash. The warp is a champagne chenille and the weft is Noro silk/cotton sock yarn and Brown Sheep chunky in a mossy green. Nice right? I used a pick up stick to achieve this honeycomb pattern described in Jane Patrick’s The Weaver’s Idea Book, published by Interweave. This book is invaluable for RHL newbies like me who want to push themselves and try out many different patterns and techniques. Indeed the rigid heddle loom group on Ravelry has a thread devoted to those weavers working their way through the book. Check it out! Learning: I want to try out the guild’s four-shaft table loom!